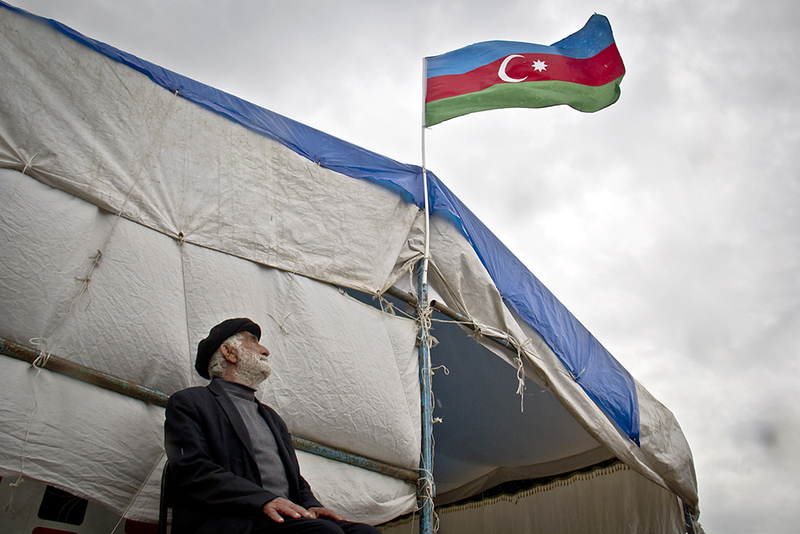 Flying outside a mourning tent in Karakechdi, a flag signals the death of 20-year-old Azerbaijani soldier Ulvin Mammadov. Elvira Shiraliyeva (right) and Faiq Shiraliyev mourn the death of their son Kamran Shiraliyev, 22, in Baku. 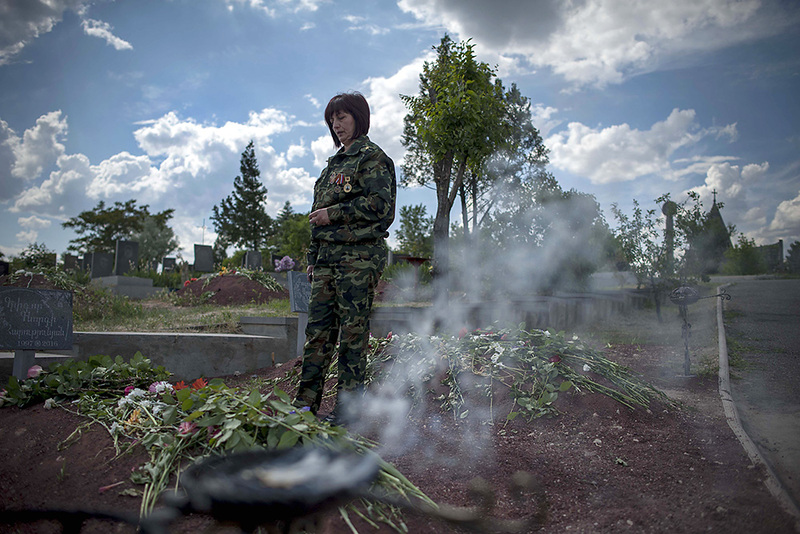 Anahit Harutyunian visits the grave of her son Grigor, 19, at a military cemetery located in the outskirts of Yerevan. 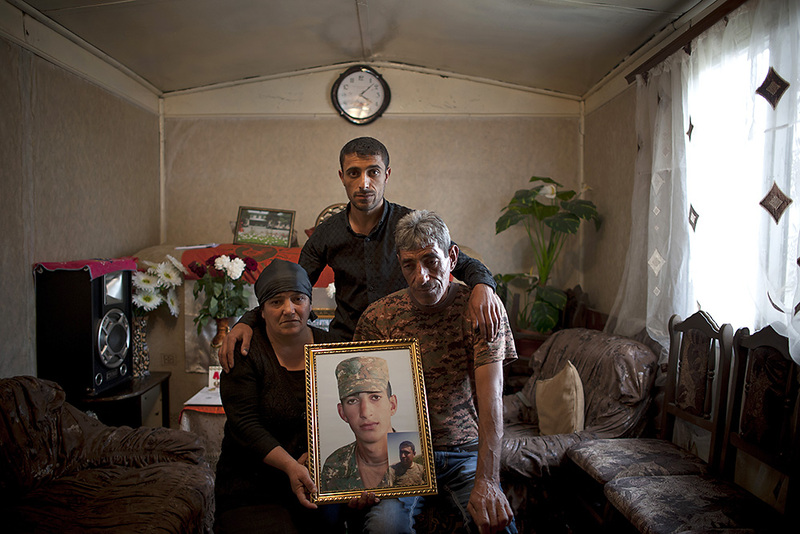 Kyaram Sloian’s mother, father and brother hold his portrait at their home in the western Armenian region of Aragatsotn. 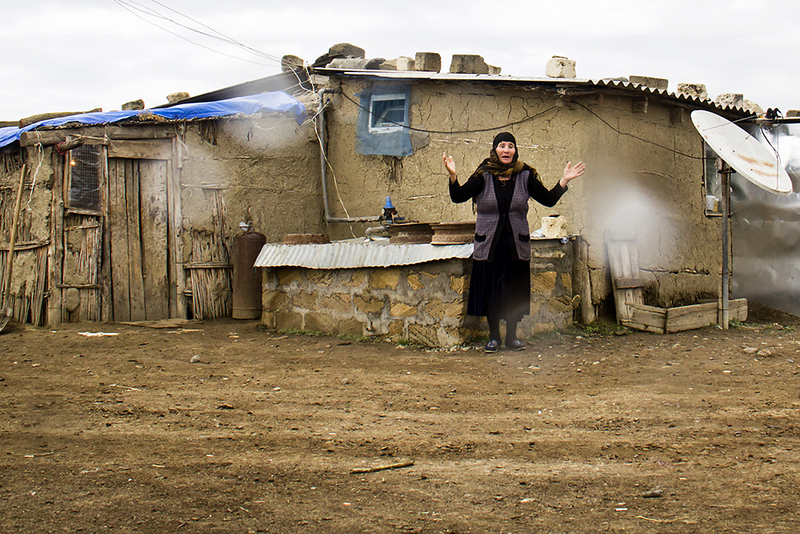 The 70-year-old grandmother of slain soldier Ulvin Mammadov stands in front of her hut made of mud and reeds. 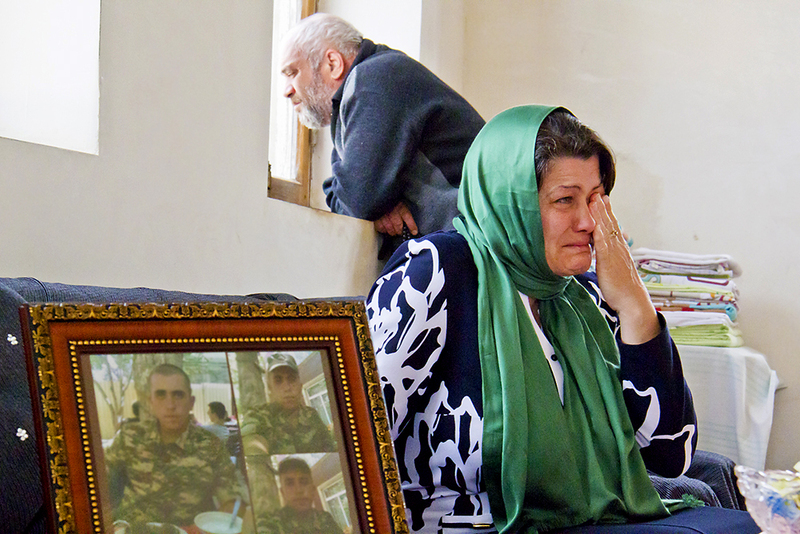 Relatives and neighbors gather to comfort Narinj Mammadova (right) at her home for the death of her son, Ulvin. Killed Armenian soldier Kyaram Sloian lived temporarily with his parents in his brother’s brick house. 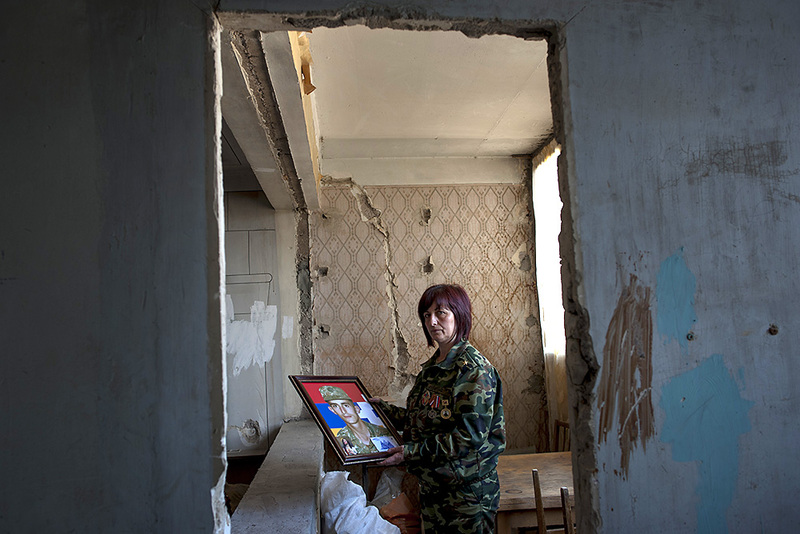 Anahit Harutyunian holds a portrait of her killed son, Grigor, at the home where they lived together. In Armenia, they are called heroes; in Azerbaijan, martyrs. One lived in a stone house with a dirt floor and no roof; the other in a mud hut with a dirt floor and a tarpaulin roof. 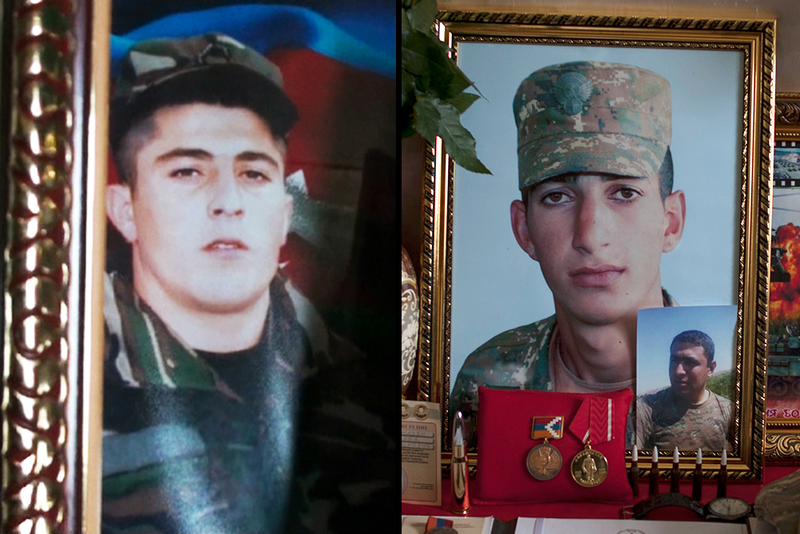 While the opposing forces hold seemingly irreconcilable positions on Karabakh’s fate, most of the soldiers who died in action during Armenia and Azerbaijan’s April 2-6 conflict had a common trait – they came from socially vulnerable families. Long frustrated by alleged corruption within their respective armies, that fact agitates many ordinary Armenians and Azerbaijanis. Military service in both countries is obligatory for males once they turn 18. Most Armenians serve for two years; Azerbaijanis for 18 months. Online and offline, a major complaint heard in both countries is the same – soldiers without influential connections or the ability to pay bribes are the ones who bear the brunt of combat. The sons of the wealthy or government officials are believed to be shielded from dangerous assignments. There is only anecdotal evidence to back this impression. Given the natural sensitivities about security, information on the deployment of individuals and units is not publically available. Meanwhile, casualty lists that indicate slain soldiers’ ages, names and hometowns are released in Armenia, but not in Azerbaijan. Nonetheless, the general public still suspects discrimination in assignments. And with cause, some analysts and activists believe. Lists of the 97 Armenian and Karabakhi soldiers killed did not include the names of men known to be the sons of senior officials or wealthy businessmen, noted Armenian human-rights activist Artur Sakunts, head of the Vanadzor office of the Helsinki Citizens’ Assembly, which works with military abuse cases, and Edgar Khachatrian, the head of Peace Dialogue, which also deals with soldiers’ rights. The Armenian Defense Ministry has refused to release demographic information about its conscript-based army, Sakunts added. The home villages listed for those killed in combat make that distinction plain. For the past month, in the hamlet of Lachin, in Azerbaijan’s frontline region of Aghcebedi, blue-red-and-green national flags have hung over the entrance way to the house of 20-year-old soldier Ulvin Mammadov, who was killed by a mortar. The mud hut has electricity, but no potable water. In this isolated area, salty soil prevents farming. Only cattle breeding provides an income. Unemployment is widespread. As for all soldiers killed in the line of duty, the Azerbaijani government covered Mammadov’s funeral expenses. His family will receive the standard monthly pension of 185 manats ($121). Surviving family members of “national heroes” receive 200 manats ($133). 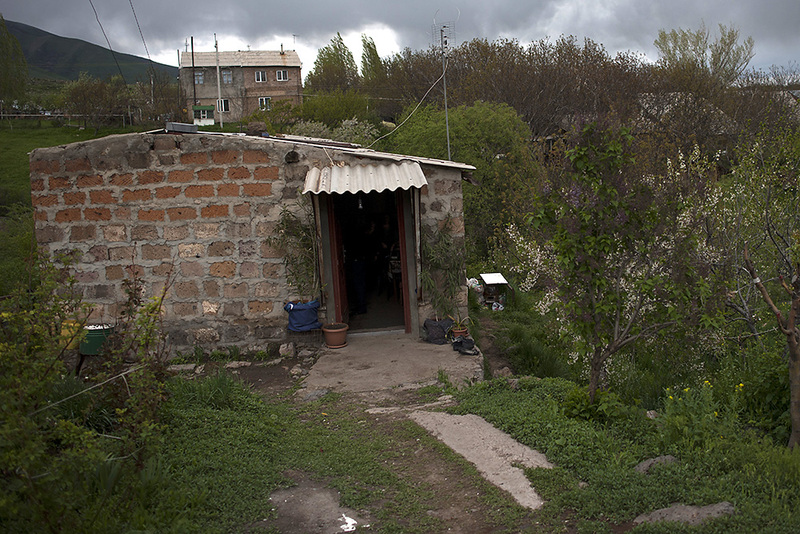 Some 400 kilometers to the east, in the western Armenian region of Aragatsotn, an Armenian family also struggles with loss amid grinding poverty. The Sloians had to bury their own son twice – once for his body and then, five days later, when his severed head arrived. Two months shy of discharge, 19-year-old Private Kyaram Sloian reportedly died when he stayed by an injured comrade during the Azerbaijani assault on the Karabakhi district of Martakert. He was killed and allegedly beheaded, though details remain unclear. Azerbaijan denies responsibility for the beheading. The Armenian government paid 700,000 drams (about $1,463) for his funeral and another 1.4 million drams (roughly $2,925) for the tombstone. Surviving families receive a onetime payment of at least 3.7 million drams ($7,731). Such assistance, including additional aid from private Armenian citizens, was welcome. None of the eight members of Sloian’s family has permanent work. The father, Kyalash, and a brother, Hamik, occasionally found work in Russia, but, now that the Russian economy is tanking, labor migration is no longer an option. The two now try to scratch out a livelihood from the land around their village. In both Armenia and Azerbaijan, those who can shield their sons from frontline service often go to great lengths to do so. One elderly woman in the Azerbaijani frontline region of Tartar told EurasiaNet.org that her family paid over 2,000 manats ($1,327) to an intermediary to ensure her grandson got a post at a “good” base, away from the frontline. She did not identify the middleman. “We got a loan from the bank and now I pay 70 manats ($46.43) a month from my pension [in interest],” the woman, who requested anonymity, recounted. In a bid “to stop complaints and prevent corruption,” the state conscription service claims it provides soldiers with “transparent” information online or via SMS about their assignments. Officials could not be reached for further comment. In Armenia, bribery is believed to be prevalent as well. In the past, families tried to arrange matters before their sons were entered into a lottery used to determine assignments. Some simply left the country. The government maintains that the lottery, which can be attended by family members, guarantees transparent and fair assignments. Armenian Defense Minister Seyran Ohanian denied on April 16 that only soldiers from impoverished families tend to be sent to the frontline. “That does not exactly correspond to reality,” he told journalists from local media outlets. Ohanian claimed that his own son, whose name he did not give, is an officer who, like the sons of “many other high-ranking officials,” serves on the frontline. One former military correspondent challenges these claims, however. Sons of senior officials may be registered as serving on the frontline, but “do not actually serve,” or, if they do, “have a privileged status on their military base,” alleged Zhanna Alexanian, who now runs the Reporters for Human Rights non-governmental organization. The government’s minimal tolerance for public criticism does not facilitate matters. Azizov, who was arrested during the 2013 protest, has attempted to establish an NGO of soldiers’ parents to push for reform, but the government has denied it registration. His campaigning now occurs on social media. “These problems, especially social injustice, will last forever if the system remains the same,” he said. He advocates for scrapping conscription and, like neighboring Georgia, establishing a contract-based army, as in “democratic and NATO countries.” Military service “will become like a job, no matter if you are a soldier or an officer,” he said. Within the North Atlantic Treaty Organization, military service has long attracted the indigent, but complaints of favoritism exist, too. Vusala Alibayli is a freelance journalist based in Azerbaijan. Marianna Grigoryan is a freelance reporter based in Armenia and editor of MediaLab.am. Nazik Armanakyan is a photojournalist based in Armenia and working for Armenianow.com. Famil Mahmudbeyli is a freelance photographer based in Azerbaijan.